Plans were yesterday unveiled for a new £6.5million visitor attraction in Moray. 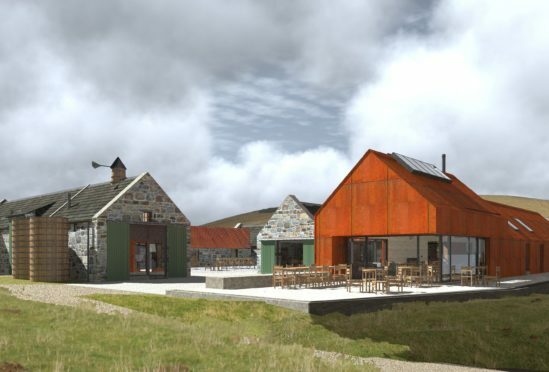 An artist’s impression of the Heritage Centre has been created on behalf of the Cabrach Trust. The multi-million-pound attraction will highlight the key role the Cabrach area has played in Scottish history, including its reputation as the birthplace of malt whisky. An 80 square mile of outstanding natural beauty, the Cabrach was once a base for illicit whisky making during the 18th century. It has also been described as a living war memorial due to the large number of abandoned buildings in the area, largely left behind by families who lost menfolk in the first and second world wars. The Heritage Centre will be constructed at the Inverharroch Farm and is expected to provide the equivalent of 10 full-time jobs. Key features planned for the centre include a museum dedicated to illicit whisky making and smuggling and a learning centre and historic working distillery which would have been in operation in the Cabrach in the 1830s. Peter Bye Jensen, Heritage Manager of the Cabrach Trust, was excited to give the public a glimpse of what the organisation wants to achieve. He said: “The Cabrach has played a central role in Scottish history; it was the home of Jacobite rebels, its illegal whisky trade led to the Scotch whisky industry we know today, and its people fought in the country’s great wars but all this was in danger of being forgotten. sessions at the Grouse Inn from 6pm until 8pm on March 28 where the plans will be on display.